Working memory is a cognitive system with a limited capacity that is responsible for temporarily holding information available for processing. Working memory is important for reasoning and the guidance of decision-making and behavior. Working memory is often used synonymously with short-term memory, but some theorists consider the two forms of memory distinct, assuming that working memory allows for the manipulation of stored information, whereas short-term memory only refers to the short-term storage of information. Working memory is a theoretical concept central to cognitive psychology, neuropsychology, and neuroscience. The term "working memory" was coined by Miller, Galanter, and Pribram, and was used in the 1960s in the context of theories that likened the mind to a computer. In 1968, Atkinson and Shiffrin used the term to describe their "short-term store". What we now call working memory was formerly referred to variously as a "short-term store" or short-term memory, primary memory, immediate memory, operant memory, and provisional memory. Short-term memory is the ability to remember information over a brief period (in the order of seconds). Most theorists today use the concept of working memory to replace or include the older concept of short-term memory, marking a stronger emphasis on the notion of manipulating information rather than mere maintenance. The earliest mention of experiments on the neural basis of working memory can be traced back to more than 100 years ago, when Hitzig and Ferrier described ablation experiments of the prefrontal cortex (PFC); they concluded that the frontal cortex was important for cognitive rather than sensory processes. In 1935 and 1936, Carlyle Jacobsen and colleagues were the first to show the deleterious effect of prefrontal ablation on delayed response. Numerous models have been proposed for how working memory functions, both anatomically and cognitively. Of those, the two that have been most influential are summarized below. In 1974, Baddeley and Hitch introduced the multicomponent model of working memory. 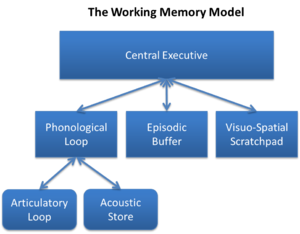 The theory proposed a model containing three components: the central executive, the phonological loop, and the visuospatial sketchpad with the central executive functioning as a control center of sorts, directing info between the phonological and visuospatial components. The central executive is responsible inter alia for directing attention to relevant information, suppressing irrelevant information and inappropriate actions, and coordinating cognitive processes when more than one task is simultaneously performed. A "central executive" is responsible for supervising the integration of information and for coordinating "slave systems" that are responsible for the short-term maintenance of information. One slave system, the phonological loop (PL), stores phonological information (that is, the sound of language) and prevents its decay by continuously refreshing it in a rehearsal loop. It can, for example, maintain a seven-digit telephone number for as long as one repeats the number to oneself again and again. The other slave system, the visuospatial sketchpad, stores visual and spatial information. It can be used, for example, for constructing and manipulating visual images and for representing mental maps. The sketchpad can be further broken down into a visual subsystem (dealing with such phenomena as shape, colour, and texture), and a spatial subsystem (dealing with location). In 2000, Baddeley extended the model by adding a fourth component, the episodic buffer, which holds representations that integrate phonological, visual, and spatial information, and possibly information not covered by the slave systems (e.g., semantic information, musical information). The episodic buffer is also the link between working memory and long-term memory. The component is episodic because it is assumed to bind information into a unitary episodic representation. The episodic buffer resembles Tulving's concept of episodic memory, but it differs in that the episodic buffer is a temporary store. The Central Executive of Working Memory is retrieving memory from the unlimited Long-term Memory. Anders Ericsson and Walter Kintsch have introduced the notion of "long-term working memory", which they define as a set of "retrieval structures" in long-term memory that enable seamless access to the information relevant for everyday tasks. In this way, parts of long-term memory effectively function as working memory. In a similar vein, Cowan does not regard working memory as a separate system from long-term memory. Representations in working memory are a subset of representations in long-term memory. Working memory is organized into two embedded levels. The first consists of long-term memory representations that are activated. There can be many of these—there is theoretically no limit to the activation of representations in long-term memory. The second level is called the focus of attention. The focus is regarded as having a limited capacity and holds up to four of the activated representations. Oberauer has extended Cowan's model by adding a third component, a more narrow focus of attention that holds only one chunk at a time. The one-element focus is embedded in the four-element focus and serves to select a single chunk for processing. For example, four digits can be held in mind at the same time in Cowan's "focus of attention". When the individual wishes to perform a process on each of these digits—for example, adding the number two to each digit—separate processing is required for each digit since most individuals cannot perform several mathematical processes in parallel. Oberauer's attentional component selects one of the digits for processing and then shifts the attentional focus to the next digit, continuing until all digits have been processed. Working memory is generally considered to have limited capacity. An early quantification of the capacity limit associated with short-term memory was the "magical number seven" suggested by Miller in 1956. He claimed that the information-processing capacity of young adults is around seven elements, which he called "chunks", regardless of whether the elements are digits, letters, words, or other units. Later research revealed this number depends on the category of chunks used (e.g., span may be around seven for digits, six for letters, and five for words), and even on features of the chunks within a category. For instance, span is lower for long than short words. In general, memory span for verbal contents (digits, letters, words, etc.) depends on the phonological complexity of the content (i.e., the number of phonemes, the number of syllables), and on the lexical status of the contents (whether the contents are words known to the person or not). Several other factors affect a person's measured span, and therefore it is difficult to pin down the capacity of short-term or working memory to a number of chunks. Nonetheless, Cowan proposed that working memory has a capacity of about four chunks in young adults (and fewer in children and old adults). Whereas most adults can repeat about seven digits in correct order, some individuals have shown impressive enlargements of their digit span—up to 80 digits. This feat is possible by extensive training on an encoding strategy by which the digits in a list are grouped (usually in groups of three to five) and these groups are encoded as a single unit (a chunk). For this to succeed, participants must be able to recognize the groups as some known string of digits. One person studied by Ericsson and his colleagues, for example, used an extensive knowledge of racing times from the history of sports in the process of coding chunks: several such chunks could then be combined into a higher-order chunk, forming a hierarchy of chunks. In this way, only some chunks at the highest level of the hierarchy must be retained in working memory, and for retrieval the chunks are unpacked. That is, the chunks in working memory act as retrieval cues that point to the digits they contain. Practicing memory skills such as these does not expand working memory capacity proper: it is the capacity to transfer (and retrieve) information from long-term memory that is improved, according to Ericsson and Kintsch (1995; see also Gobet & Simon, 2000). Working memory capacity can be tested by a variety of tasks. A commonly used measure is a dual-task paradigm, combining a memory span measure with a concurrent processing task, sometimes referred to as "complex span". Daneman and Carpenter invented the first version of this kind of task, the "reading span", in 1980. Subjects read a number of sentences (usually between two and six) and tried to remember the last word of each sentence. At the end of the list of sentences, they repeated back the words in their correct order. Other tasks that do not have this dual-task nature have also been shown to be good measures of working memory capacity. Whereas Daneman and Carpenter believed that the combination of "storage" (maintenance) and processing is needed to measure working memory capacity, we know now that the capacity of working memory can be measured with short-term memory tasks that have no additional processing component. Conversely, working memory capacity can also be measured with certain processing tasks that don't involve maintenance of information. The question of what features a task must have to qualify as a good measure of working memory capacity is a topic of ongoing research. Measures of working-memory capacity are strongly related to performance in other complex cognitive tasks, such as reading comprehension, problem solving, and with measures of intelligence quotient. Some researchers have argued that working-memory capacity reflects the efficiency of executive functions, most notably the ability to maintain multiple task-relevant representations in the face of distracting irrelevant information; and that such tasks seem to reflect individual differences in the ability to focus and maintain attention, particularly when other events are serving to capture attention. Both working memory and executive functions rely strongly, though not exclusively, on frontal brain areas. Other researchers have argued that the capacity of working memory is better characterized as the ability to mentally form relations between elements, or to grasp relations in given information. This idea has been advanced, among others, by Graeme Halford, who illustrated it by our limited ability to understand statistical interactions between variables. These authors asked people to compare written statements about the relations between several variables to graphs illustrating the same or a different relation, as in the following sentence: "If the cake is from France, then it has more sugar if it is made with chocolate than if it is made with cream, but if the cake is from Italy, then it has more sugar if it is made with cream than if it is made of chocolate". This statement describes a relation between three variables (country, ingredient, and amount of sugar), which is the maximum most individuals can understand. The capacity limit apparent here is obviously not a memory limit (all relevant information can be seen continuously) but a limit to how many relationships are discerned simultaneously. There are several hypotheses about the nature of the capacity limit. One is that a limited pool of cognitive resources needed to keep representations active and thereby available for processing, and for carrying out processes. Another hypothesis is that memory traces in working memory decay within a few seconds, unless refreshed through rehearsal, and because the speed of rehearsal is limited, we can maintain only a limited amount of information. Yet another idea is that representations held in working memory interfere with each other. The assumption that the contents of short-term or working memory decay over time, unless decay is prevented by rehearsal, goes back to the early days of experimental research on short-term memory. It is also an important assumption in the multi-component theory of working memory. The most elaborate decay-based theory of working memory to date is the "time-based resource sharing model". This theory assumes that representations in working memory decay unless they are refreshed. Refreshing them requires an attentional mechanism that is also needed for any concurrent processing task. When there are small time intervals in which the processing task does not require attention, this time can be used to refresh memory traces. The theory therefore predicts that the amount of forgetting depends on the temporal density of attentional demands of the processing task—this density is called "cognitive load". The cognitive load depends on two variables, the rate at which the processing task requires individual steps to be carried out, and the duration of each step. For example, if the processing task consists of adding digits, then having to add another digit every half second places a higher cognitive load on the system than having to add another digit every two seconds. In a series of experiments, Barrouillet and colleagues have shown that memory for lists of letters depends neither on the number of processing steps nor the total time of processing but on cognitive load. Resource theories assume that the capacity of working memory is a limited resource that must be shared between all representations that need to be maintained in working memory simultaneously. Some resource theorists also assume that maintenance and concurrent processing share the same resource; this can explain why maintenance is typically impaired by a concurrent processing demand. Resource theories have been very successful in explaining data from tests of working memory for simple visual features, such as colors or orientations of bars. An ongoing debate is whether the resource is a continuous quantity that can be subdivided among any number of items in working memory, or whether it consists of a small number of discrete "slots", each of which can be assigned to one memory item, so that only a limited number of about 3 items can be maintained in working memory at all. Several forms of interference have been discussed by theorists. One of the oldest ideas is that new items simply replace older ones in working memory. Another form of interference is retrieval competition. For example, when the task is to remember a list of 7 words in their order, we need to start recall with the first word. While trying to retrieve the first word, the second word, which is represented in proximity, is accidentally retrieved as well, and the two compete for being recalled. Errors in serial recall tasks are often confusions of neighboring items on a memory list (so-called transpositions), showing that retrieval competition plays a role in limiting our ability to recall lists in order, and probably also in other working memory tasks. A third form of interference is the distortion of representations by superposition: When multiple representations are added on top of each other, each of them is blurred by the presence of all the others. A fourth form of interference assumed by some authors is feature overwriting. The idea is that each word, digit, or other item in working memory is represented as a bundle of features, and when two items share some features, one of them steals the features from the other. The more items are held in working memory, and the more their features overlap, the more each of them will be degraded by the loss of some features. None of these hypotheses can explain the experimental data entirely. The resource hypothesis, for example, was meant to explain the trade-off between maintenance and processing: The more information must be maintained in working memory, the slower and more error prone concurrent processes become, and with a higher demand on concurrent processing memory suffers. This trade-off has been investigated by tasks like the reading-span task described above. It has been found that the amount of trade-off depends on the similarity of the information to be remembered and the information to be processed. For example, remembering numbers while processing spatial information, or remembering spatial information while processing numbers, impair each other much less than when material of the same kind must be remembered and processed. Also, remembering words and processing digits, or remembering digits and processing words, is easier than remembering and processing materials of the same category. These findings are also difficult to explain for the decay hypothesis, because decay of memory representations should depend only on how long the processing task delays rehearsal or recall, not on the content of the processing task. A further problem for the decay hypothesis comes from experiments in which the recall of a list of letters was delayed, either by instructing participants to recall at a slower pace, or by instructing them to say an irrelevant word once or three times in between recall of each letter. Delaying recall had virtually no effect on recall accuracy. The interference theory seems to fare best with explaining why the similarity between memory contents and the contents of concurrent processing tasks affects how much they impair each other. More similar materials are more likely to be confused, leading to retrieval competition. The capacity of working memory increases gradually over childhood and declines gradually in old age. Working memory is among the cognitive functions most sensitive to decline in old age. Several explanations have been offered for this decline in psychology. One is the processing speed theory of cognitive aging by Tim Salthouse. Drawing on the finding of general slowing of cognitive processes as people grow older, Salthouse argues that slower processing leaves more time for working-memory contents to decay, thus reducing effective capacity. However, the decline of working-memory capacity cannot be entirely attributed to slowing because capacity declines more in old age than speed. Another proposal is the inhibition hypothesis advanced by Lynn Hasher and Rose Zacks. This theory assumes a general deficit in old age in the ability to inhibit irrelevant, or no-longer relevant, information. Therefore, working memory tends to be cluttered with irrelevant contents that reduce the effective capacity for relevant content. The assumption of an inhibition deficit in old age has received much empirical support but, so far, it is not clear whether the decline in inhibitory ability fully explains the decline of working-memory capacity. An explanation on the neural level of the decline of working memory and other cognitive functions in old age has been proposed by West. He argued that working memory depends to a large degree on the pre-frontal cortex, which deteriorates more than other brain regions as we grow old. Age related decline in working memory can be briefly reversed using low intensity transcranial stimulation, synchronizing rhythms in bilateral frontal and left temporal lobe areas. In another influential study, training with a working memory task (the dual n-back task) has improved performance on a fluid intelligence test in healthy young adults. The improvement of fluid intelligence by training with the n-back task was replicated in 2010, but two studies published in 2012 failed to reproduce the effect. The combined evidence from about 30 experimental studies on the effectiveness of working-memory training has been evaluated by several meta-analyses. The authors of these meta-analyses disagree in their conclusions as to whether or not working-memory training improves intelligence. Yet, these meta-analyses agree in their estimate of the size of the effect of working-memory training: If there is such an effect, it is likely to be small. The first insights into the neuronal and neurotransmitter basis of working memory came from animal research. The work of Jacobsen and Fulton in the 1930s first showed that lesions to the PFC impaired spatial working memory performance in monkeys. The later work of Joaquin Fuster recorded the electrical activity of neurons in the PFC of monkeys while they were doing a delayed matching task. In that task, the monkey sees how the experimenter places a bit of food under one of two identical-looking cups. A shutter is then lowered for a variable delay period, screening off the cups from the monkey's view. After the delay, the shutter opens and the monkey is allowed to retrieve the food from under the cups. Successful retrieval in the first attempt – something the animal can achieve after some training on the task – requires holding the location of the food in memory over the delay period. Fuster found neurons in the PFC that fired mostly during the delay period, suggesting that they were involved in representing the food location while it was invisible. Later research has shown similar delay-active neurons also in the posterior parietal cortex, the thalamus, the caudate, and the globus pallidus. The work of Goldman-Rakic and others showed that principal sulcal, dorsolateral PFC interconnects with all of these brain regions, and that neuronal microcircuits within PFC are able to maintain information in working memory through recurrent excitatory glutamate networks of pyramidal cells that continue to fire throughout the delay period. These circuits are tuned by lateral inhibition from GABAergic interneurons. The neuromodulatory arousal systems markedly alter PFC working memory function; for example, either too little or too much dopamine or norepinephrine impairs PFC network firing and working memory performance. The research described above on persistent firing of certain neurons in the delay period of working memory tasks shows that the brain has a mechanism of keeping representations active without external input. Keeping representations active, however, is not enough if the task demands maintaining more than one chunk of information. In addition, the components and features of each chunk must be bound together to prevent them from being mixed up. For example, if a red triangle and a green square must be remembered at the same time, one must make sure that "red" is bound to "triangle" and "green" is bound to "square". One way of establishing such bindings is by having the neurons that represent features of the same chunk fire in synchrony, and those that represent features belonging to different chunks fire out of sync. In the example, neurons representing redness would fire in synchrony with neurons representing the triangular shape, but out of sync with those representing the square shape. So far, there is no direct evidence that working memory uses this binding mechanism, and other mechanisms have been proposed as well. It has been speculated that synchronous firing of neurons involved in working memory oscillate with frequencies in the theta band (4 to 8 Hz). Indeed, the power of theta frequency in the EEG increases with working memory load, and oscillations in the theta band measured over different parts of the skull become more coordinated when the person tries to remember the binding between two components of information. Localization of brain functions in humans has become much easier with the advent of brain imaging methods (PET and fMRI). This research has confirmed that areas in the PFC are involved in working memory functions. During the 1990s much debate has centered on the different functions of the ventrolateral (i.e., lower areas) and the dorsolateral (higher) areas of the PFC. A human lesion study provides additional evidence for the role of the dorsolateral prefrontal cortex in working memory. One view was that the dorsolateral areas are responsible for spatial working memory and the ventrolateral areas for non-spatial working memory. Another view proposed a functional distinction, arguing that ventrolateral areas are mostly involved in pure maintenance of information, whereas dorsolateral areas are more involved in tasks requiring some processing of the memorized material. The debate is not entirely resolved but most of the evidence supports the functional distinction. Brain imaging has also revealed that working memory functions are not limited to the PFC. A review of numerous studies shows areas of activation during working memory tasks scattered over a large part of the cortex. There is a tendency for spatial tasks to recruit more right-hemisphere areas, and for verbal and object working memory to recruit more left-hemisphere areas. The activation during verbal working memory tasks can be broken down into one component reflecting maintenance, in the left posterior parietal cortex, and a component reflecting subvocal rehearsal, in the left frontal cortex (Broca's area, known to be involved in speech production). There is an emerging consensus that most working memory tasks recruit a network of PFC and parietal areas. A study has shown that during a working memory task the connectivity between these areas increases. Another study has demonstrated that these areas are necessary for working memory, and not simply activated accidentally during working memory tasks, by temporarily blocking them through transcranial magnetic stimulation (TMS), thereby producing an impairment in task performance. A current debate concerns the function of these brain areas. The PFC has been found to be active in a variety of tasks that require executive functions. This has led some researchers to argue that the role of PFC in working memory is in controlling attention, selecting strategies, and manipulating information in working memory, but not in maintenance of information. The maintenance function is attributed to more posterior areas of the brain, including the parietal cortex. Other authors interpret the activity in parietal cortex as reflecting executive functions, because the same area is also activated in other tasks requiring attention but not memory. A 2003 meta-analysis of 60 neuroimaging studies found left frontal cortex was involved in low-task demand verbal working memory and right frontal cortex for spatial working memory. Brodmann's areas (BAs) 6, 8, and 9, in the superior frontal cortex was involved when working memory must be continuously updated and when memory for temporal order had to be maintained. Right Brodmann 10 and 47 in the ventral frontal cortex were involved more frequently with demand for manipulation such as dual-task requirements or mental operations, and Brodmann 7 in the posterior parietal cortex was also involved in all types of executive function. Working memory has been suggested to involve two processes with different neuroanatomical locations in the frontal and parietal lobes. First, a selection operation that retrieves the most relevant item, and second an updating operation that changes the focus of attention made upon it. Updating the attentional focus has been found to involve the transient activation in the caudal superior frontal sulcus and posterior parietal cortex, while increasing demands on selection selectively changes activation in the rostral superior frontal sulcus and posterior cingulate/precuneus. Articulating the differential function of brain regions involved in working memory is dependent on tasks able to distinguish these functions. Most brain imaging studies of working memory have used recognition tasks such as delayed recognition of one or several stimuli, or the n-back task, in which each new stimulus in a long series must be compared to the one presented n steps back in the series. The advantage of recognition tasks is that they require minimal movement (just pressing one of two keys), making fixation of the head in the scanner easier. Experimental research and research on individual differences in working memory, however, has used largely recall tasks (e.g., the reading span task, see below). It is not clear to what degree recognition and recall tasks reflect the same processes and the same capacity limitations. Brain imaging studies have been conducted with the reading span task or related tasks. Increased activation during these tasks was found in the PFC and, in several studies, also in the anterior cingulate cortex (ACC). People performing better on the task showed larger increase of activation in these areas, and their activation was correlated more over time, suggesting that their neural activity in these two areas was better coordinated, possibly due to stronger connectivity. One approach to model the neurophysiology and the functioning of working memory is the prefrontal cortex basal ganglia working memory (PBWM). Working memory is impaired by acute and chronic psychological stress. This phenomenon was first discovered in animal studies by Arnsten and colleagues, who have shown that stress-induced catecholamine release in PFC rapidly decreases PFC neuronal firing and impairs working memory performance through feedforward, intracellular signaling pathways. Exposure to chronic stress leads to more profound working memory deficits and additional architectural changes in PFC, including dendritic atrophy and spine loss, which can be prevented by inhibition of protein kinase C signaling. fMRI research has extended this research to humans, and confirms that reduced working memory caused by acute stress links to reduced activation of the PFC, and stress increased levels of catecholamines. Imaging studies of medical students undergoing stressful exams have also shown weakened PFC functional connectivity, consistent with the animal studies. The marked effects of stress on PFC structure and function may help to explain how stress can cause or exacerbate mental illness. The more stress in one's life, the lower the efficiency of working memory in performing simple cognitive tasks. Students who performed exercises that reduced the intrusion of negative thoughts showed an increase in their working memory capacity. Mood states (positive or negative) can have an influence on the neurotransmitter dopamine, which in turn can affect problem solving. Alcohol abuse can result in brain damage which impairs working memory. Alcohol has an effect on the blood-oxygen-level-dependent (BOLD) response. The BOLD response correlates increased blood oxygenation with brain activity, which makes this response a useful tool for measuring neuronal activity. The BOLD response affects regions of the brain such as the basal ganglia and thalamus when performing a working memory task. Adolescents who start drinking at a young age show a decreased BOLD response in these brain regions. Alcohol dependent young women in particular exhibit less of a BOLD response in parietal and frontal cortices when performing a spatial working memory task. Binge drinking, specifically, can also affect one's performance on working memory tasks, particularly visual working memory. Additionally, there seems to be a gender difference in regards to how alcohol affects working memory. While women perform better on verbal working memory tasks after consuming alcohol compared to men, they appear to perform worse on spatial working memory tasks as indicated by less brain activity. Finally, age seems to be an additional factor. Older adults are more susceptible than others to the effects of alcohol on working memory. Individual differences in working-memory capacity are to some extent heritable; that is, about half of the variation between individuals is related to differences in their genes. The genetic component of variability of working-memory capacity is largely shared with that of fluid intelligence. Little is known about which genes are related to the functioning of working memory. Within the theoretical framework of the multi-component model, one candidate gene has been proposed, namely ROBO1 for the hypothetical phonological loop component of working memory. Working memory capacity is correlated with learning outcomes in literacy and numeracy. Initial evidence for this relation comes from the correlation between working-memory capacity and reading comprehension, as first observed by Daneman and Carpenter (1980) and confirmed in a later meta-analytic review of several studies. Subsequent work found that working memory performance in primary school children accurately predicted performance in mathematical problem solving. One longitudinal study showed that a child's working memory at 5 years old is a better predictor of academic success than IQ. In a large-scale screening study, one in ten children in mainstream classrooms were identified with working memory deficits. The majority of them performed very poorly in academic achievements, independent of their IQ. Similarly, working memory deficits have been identified in national curriculum low-achievers as young as seven years of age. Without appropriate intervention, these children lag behind their peers. A recent study of 37 school-age children with significant learning disabilities has shown that working memory capacity at baseline measurement, but not IQ, predicts learning outcomes two years later. This suggests that working memory impairments are associated with low learning outcomes and constitute a high risk factor for educational underachievement for children. In children with learning disabilities such as dyslexia, ADHD, and developmental coordination disorder, a similar pattern is evident. There is some evidence that optimal working memory performance links to the neural ability to focus attention on task-relevant information and to ignore distractions, and that practice-related improvement in working memory is due to increasing these abilities. One line of research suggests a link between the working memory capacities of a person and their ability to control the orientation of attention to stimuli in the environment. Such control enables people to attend to information important for their current goals, and to ignore goal-irrelevant stimuli that tend to capture their attention due to their sensory saliency (such as an ambulance siren). The direction of attention according to one's goals is assumed to rely on "top-down" signals from the pre-frontal cortex (PFC) that biases processing in posterior cortical areas. Capture of attention by salient stimuli is assumed to be driven by "bottom-up" signals from subcortical structures and the primary sensory cortices. The ability to override "bottom-up" capture of attention differs between individuals, and this difference has been found to correlate with their performance in a working-memory test for visual information. Another study, however, found no correlation between the ability to override attentional capture and measures of more general working-memory capacity. ADHD: Several authors have proposed that symptoms of ADHD arise from a primary deficit in a specific executive function (EF) domain such as working memory, response inhibition or a more general weakness in executive control. A meta-analytical review cites several studies that found significant lower group results for ADHD in spatial and verbal working memory tasks, and in several other EF tasks. However, the authors concluded that EF weaknesses neither are necessary nor sufficient to cause all cases of ADHD. Several neurotransmitters, such as dopamine and glutamate may be both involved in ADHD and working memory. Both are associated with the frontal brain, self-direction and self-regulation, but cause–effect have not been confirmed, so it is unclear whether working memory dysfunction leads to ADHD, or ADHD distractibility leads to poor functionality of working memory, or if there is some other connection. Parkinson's disease: Patients with Parkinson's show signs of a reduced verbal function of working memory. They wanted to find if the reduction is due to a lack of ability to focus on relevant tasks, or a low amount of memory capacity. Twenty-one patients with Parkinson's were tested in comparison to the control group of 28 participants of the same age.The researchers found that both hypotheses were the reason working memory function is reduced which did not fully agree with their hypothesis that it is either one or the other. Alzheimer's disease: As Alzheimer's disease becomes more serious, less working memory functions. There is one study that focuses on the neural connections and fluidity of working memory in mice brains. Half of the mice were given an injection that is similar to Alzheimer's effects, and the other half were not. Then they were expected to go through a maze that is a task to test working memory. The study help answer questions about how Alzheimer's can deteriorate the working memory and ultimately obliterate memory functions. Huntington's disease: A group of researchers hosted a study that researched the function and connectivity of working memory over a 30-month longitudinal experiment. It found that there were certain places in the brain where most connectivity was decreased in pre-Huntington diseased patients, in comparison to the control group that remained consistently functional. ^ Miyake, A.; Shah, P., eds. (1999). Models of working memory. Mechanisms of active maintenance and executive control. Cambridge University Press. ^ a b Diamond A (2013). "Executive functions". Annu Rev Psychol. 64: 135–168. doi:10.1146/annurev-psych-113011-143750. PMC 4084861. PMID 23020641. WM (holding information in mind and manipulating it) is distinct from short-term memory (just holding information in mind). They cluster onto separate factors in factor analyses of children, adolescents, and adults (Alloway et al. 2004, Gathercole et al. 2004). They are linked to different neural subsystems. WM relies more on dorsolateral prefrontal cortex, whereas maintaining information in mind but not manipulating it [as long as the number of items is not huge (suprathreshold)] does not need involvement of dorsolateral prefrontal cortex (D’Esposito et al. 1999, Eldreth et al. 2006, Smith & Jonides 1999). Imaging studies show frontal activation only in ventrolateral prefrontal cortex for memory maintenance that is not suprathreshold. WM and short-term memory also show different developmental progressions; the latter develops earlier and faster. ^ Malenka RC, Nestler EJ, Hyman SE (2009). "Chapter 13: Higher Cognitive Function and Behavioral Control". In Sydor A, Brown RY (eds.). Molecular Neuropharmacology: A Foundation for Clinical Neuroscience (2nd ed.). New York: McGraw-Hill Medical. pp. 313–321. ISBN 978-0-07-148127-4. • Executive function, the cognitive control of behavior, depends on the prefrontal cortex, which is highly developed in higher primates and especially humans. working memory may be impaired in ADHD, the most common childhood psychiatric disorder seen in clinical settings ... ADHD can be conceptualized as a disorder of executive function; specifically, ADHD is characterized by reduced ability to exert and maintain cognitive control of behavior. Compared with healthy individuals, those with ADHD have diminished ability to suppress inappropriate prepotent responses to stimuli (impaired response inhibition) and diminished ability to inhibit responses to irrelevant stimuli (impaired interference suppression). ... Early results with structural MRI show thinning of the cerebral cortex in ADHD subjects compared with age-matched controls in prefrontal cortex and posterior parietal cortex, areas involved in working memory and attention. ^ Cowan, Nelson (2008). What are the differences between long-term, short-term, and working memory?. Prog. Brain Res. Progress in Brain Research. 169. pp. 323–338. doi:10.1016/S0079-6123(07)00020-9. ISBN 978-0-444-53164-3. PMC 2657600. PMID 18394484. ^ Pribram, Karl H.; Miller, George A.; Galanter, Eugene (1960). Plans and the structure of behavior. New York: Holt, Rinehart and Winston. p. 65. ISBN 978-0-03-010075-8. OCLC 190675. ^ Baddeley A (October 2003). "Working memory: looking back and looking forward". Nature Reviews Neuroscience. 4 (10): 829–39. doi:10.1038/nrn1201. PMID 14523382. ^ Atkinson, R.C. ; Shiffrin, R.M. (1968). Kenneth W Spence; Janet T Spence (eds.). Human Memory: A Proposed System and its Control Processes. The psychology of learning and motivation. 2. Academic Press. pp. 89–195. doi:10.1016/S0079-7421(08)60422-3. ISBN 978-0-12-543302-0. OCLC 185468704. ^ a b Fuster, Joaquin (2008). The prefrontal cortex (4 ed.). Oxford, UK: Elsevier. p. 126. ISBN 978-0-12-373644-4. ^ Benton, A. L. (1991). "The prefrontal region:Its early history". In Levin, Harvey, S.; Eisenberg, Howard, M.; Benton, Arthur, L. (eds.). Frontal lobe function and dysfunction. New York: Oxford University Press. p. 19. ISBN 978-0-19-506284-7. ^ Baddeley, Alan D.; Hitch, Graham (1974). Gordon H. Bower (ed.). Working Memory. The psychology of learning and motivation. 2. Academic Press. pp. 47–89. doi:10.1016/S0079-7421(08)60452-1. ISBN 978-0-12-543308-2. OCLC 777285348. ^ Levin, E.S. (2011). Working Memory : Capacity, Developments and Improvement Techniques. New York: Nova Science Publishers, Inc.
^ Weiten, W. (2013). Variations in psychology (9 ed.). New York: Wadsworth. pp. 281–282. ^ Weiten, W. (2013). Variations in psychology (9 ed.). Belmont, CA: Wadsworth. pp. 281–282. ^ Baddeley, A. D. (2000). "The episodic buffer: a new component of working memory?" (PDF). Trends Cogn. Sci. 4 (11): 417–423. doi:10.1016/S1364-6613(00)01538-2. PMID 11058819. ^ Ericsson, K. A. & Kintsch, W. (1995). "Long-term working memory". Psychological Review. 102 (2): 211–245. doi:10.1037/0033-295X.102.2.211. PMID 7740089. ^ Schweppe, J. (2014). "Attention, working memory, and long-term memory in multimedia learning: A integrated perspective based on process models of working memory". Educational Psychology Review. 26 (2): 289. doi:10.1007/s10648-013-9242-2. ^ Oberauer K (May 2002). "Access to information in working memory: exploring the focus of attention". Journal of Experimental Psychology: Learning, Memory, and Cognition. 28 (3): 411–21. CiteSeerX 10.1.1.163.4979. doi:10.1037/0278-7393.28.3.411. PMID 12018494. ^ Miller GA (March 1956). "The magical number seven plus or minus two: some limits on our capacity for processing information". Psychological Review. 63 (2): 81–97. CiteSeerX 10.1.1.308.8071. doi:10.1037/h0043158. PMID 13310704. Republished: Miller GA (April 1994). "The magical number seven, plus or minus two: some limits on our capacity for processing information. 1956". Psychological Review. 101 (2): 343–52. doi:10.1037/0033-295X.101.2.343. PMID 8022966. ^ Service, Elisabet (1 May 1998). "The Effect of Word Length on Immediate Serial Recall Depends on Phonological Complexity, Not Articulatory Duration". The Quarterly Journal of Experimental Psychology Section A. 51 (2): 283–304. doi:10.1080/713755759. ISSN 0272-4987. ^ Hulme, Charles; Roodenrys, Steven; Brown, Gordon; Mercer, Robin (November 1995). "The role of long-term memory mechanisms in memory span". British Journal of Psychology. 86 (4): 527–36. doi:10.1111/j.2044-8295.1995.tb02570.x. ^ Cowan, Nelson (2001). "The magical number 4 in short-term memory: A reconsideration of mental storage capacity". Behavioral and Brain Sciences. 24 (1): 87–185. doi:10.1017/S0140525X01003922. PMID 11515286. ^ Gobet F (November 2000). "Some shortcomings of long-term working memory". British Journal of Psychology (Submitted manuscript). 91 (Pt 4): 551–70. doi:10.1348/000712600161989. PMID 11104178. ^ Daneman, Meredyth; Carpenter, Patricia A. (August 1980). "Individual differences in working memory and reading". Journal of Verbal Learning & Verbal Behavior. 19 (4): 450–66. doi:10.1016/S0022-5371(80)90312-6. ^ Oberauer, K.; Süss, H.-M.; Schulze, R.; Wilhelm, O.; Wittmann, W. W. (December 2000). "Working memory capacity—facets of a cognitive ability construct". Personality and Individual Differences. 29 (6): 1017–45. doi:10.1016/S0191-8869(99)00251-2. ^ Unsworth, Nash; Engle, Randall W. (2007). "On the division of short-term and working memory: An examination of simple and complex span and their relation to higher order abilities". Psychological Bulletin. 133 (6): 1038–1066. doi:10.1037/0033-2909.133.6.1038. PMID 17967093. ^ Chuderski, Adam (25 September 2013). "The relational integration task explains fluid reasoning above and beyond other working memory tasks". Memory & Cognition. 42 (3): 448–463. doi:10.3758/s13421-013-0366-x. ISSN 0090-502X. PMC 3969517. PMID 24222318. ^ Conway AR, Kane MJ, Engle RW (December 2003). "Working memory capacity and its relation to general intelligence". Trends in Cognitive Sciences. 7 (12): 547–52. CiteSeerX 10.1.1.538.4967. doi:10.1016/j.tics.2003.10.005. PMID 14643371. ^ Engle, R. W.; Tuholski, S. W.; Laughlin, J. E.; Conway, A. R. (September 1999). "Working memory, short-term memory, and general fluid intelligence: a latent-variable approach". Journal of Experimental Psychology: General. 128 (3): 309–31. doi:10.1037/0096-3445.128.3.309. PMID 10513398. ^ a b Kane, M. J.; Engle, R. W. (December 2002). "The role of prefrontal cortex in working-memory capacity, executive attention, and general fluid intelligence: an individual-differences perspective". Psychonomic Bulletin & Review. 9 (4): 637–71. doi:10.3758/BF03196323. PMID 12613671. ^ Halford, G. S.; Baker, R.; McCredden, J. E.; Bain, J. D. (January 2005). "How many variables can humans process?". Psychological Science. 16 (1): 70–76. doi:10.1111/j.0956-7976.2005.00782.x. PMID 15660854. ^ a b Just, M. A.; Carpenter, P. A. (January 1992). "A capacity theory of comprehension: individual differences in working memory". Psychological Review. 99 (1): 122–49. doi:10.1037/0033-295X.99.1.122. PMID 1546114. ^ Towse, J. N.; Hitch, G. J.; Hutton, U. (April 2000). "On the interpretation of working memory span in adults". Memory & Cognition. 28 (3): 341–8. doi:10.3758/BF03198549. PMID 10881551. ^ Waugh NC, Norman DA (March 1965). "Primary Memory". Psychological Review. 72 (2): 89–104. doi:10.1037/h0021797. PMID 14282677. ^ Brown, J. (1958). "Some tests of the decay theory of immediate memory". Quarterly Journal of Experimental Psychology. 10: 12–21. doi:10.1080/17470215808416249. ^ Peterson, L. R.; Peterson, M. J. (1959). "Short-term retention of individual verbal items". Journal of Experimental Psychology. 58 (3): 193–198. CiteSeerX 10.1.1.227.1807. doi:10.1037/h0049234. PMID 14432252. ^ Baddeley, A. D. (1986). Working memory. Oxford: Clarendon. ^ Barrouillet P, Bernardin S, Camos V (March 2004). "Time constraints and resource sharing in adults' working memory spans". Journal of Experimental Psychology: General. 133 (1): 83–100. CiteSeerX 10.1.1.379.9208. doi:10.1037/0096-3445.133.1.83. PMID 14979753. ^ Ma, W. J.; Husain, M.; Bays, P. M. (2014). "Changing concepts of working memory". Nature Reviews Neuroscience. 17 (3): 347–356. doi:10.1038/nn.3655. PMC 4159388. PMID 24569831. ^ van den Berg, Ronald; Awh, Edward; Ma, Wei Ji (2014). "Factorial comparison of working memory models". Psychological Review. 121 (1): 124–149. doi:10.1037/a0035234. PMC 4159389. PMID 24490791. ^ Oberauer, Klaus; Lewandowsky, Stephan; Farrell, Simon; Jarrold, Christopher; Greaves, Martin (20 June 2012). "Modeling working memory: An interference model of complex span". Psychonomic Bulletin & Review. 19 (5): 779–819. doi:10.3758/s13423-012-0272-4. ISSN 1069-9384. PMID 22715024. ^ Oberauer, Klaus; Kliegl, Reinhold (November 2006). "A formal model of capacity limits in working memory". Journal of Memory and Language. 55 (4): 601–26. doi:10.1016/j.jml.2006.08.009. ^ Bancroft, T.; Servos, P. (2011). "Distractor frequency influences performance in vibrotactile working memory". Experimental Brain Research. 208 (4): 529–32. doi:10.1007/s00221-010-2501-2. PMID 21132280. ^ Maehara, Yukio; Saito, Satoru (February 2007). "The relationship between processing and storage in working memory span: Not two sides of the same coin". Journal of Memory and Language. 56 (2): 212–228. doi:10.1016/j.jml.2006.07.009. ^ Li, Karen Z.H. (June 1999). "Selection from Working Memory: on the Relationship between Processing and Storage Components". Aging, Neuropsychology, and Cognition. 6 (2): 99–116. doi:10.1076/anec.6.2.99.784. ^ Lewandowsky S, Duncan M, Brown GD (October 2004). "Time does not cause forgetting in short-term serial recall". Psychonomic Bulletin & Review. 11 (5): 771–90. doi:10.3758/BF03196705. PMID 15732687. ^ Oberauer K, Lewandowsky S (July 2008). "Forgetting in immediate serial recall: decay, temporal distinctiveness, or interference?". Psychological Review. 115 (3): 544–76. doi:10.1037/0033-295X.115.3.544. PMID 18729591. ^ a b Gathercole, S. E.; Pickering, S. J.; Ambridge, B.; Wearing, H. (2004). "The structure of working memory from 4 to 15 years of age". Developmental Psychology. 40 (2): 177–190. CiteSeerX 10.1.1.529.2727. doi:10.1037/0012-1649.40.2.177. PMID 14979759. ^ Salthouse, T. A. (1994). "The aging of working memory". Neuropsychology. 8 (4): 535–543. doi:10.1037/0894-4105.8.4.535. ^ Pascual-Leone, J. (1970). "A mathematical model for the transition rule in Piaget's developmental stages". Acta Psychologica. 32: 301–345. doi:10.1016/0001-6918(70)90108-3. ^ Case, R. (1985). Intellectual development. Birth to adulthood. New York: Academic Press. ^ Jarrold, C., & Bayliss, D. M. (2007). Variation in working memory due to typical and atypical development. In A. R. A. Conway, C. Jarrold, M. J. Kane, A. Miyake & J. N. Towse (Eds. ), Variation in working memory (pp. 137–161). New York: Oxford University Press. ^ Kail, R. (2007). "Longitudinal evidence that increases in processing speed and working memory enhance children's reasoning". Psychological Science. 18 (4): 312–313. doi:10.1111/j.1467-9280.2007.01895.x. PMID 17470254. ^ Andrews, G.; Halford, G. S. (2002). "A cognitive complexity metric applied to cognitive development". Cognitive Psychology. 45 (2): 153–219. doi:10.1016/S0010-0285(02)00002-6. PMID 12528901. ^ Yaple, Z., Arsalidou, M (2018). N-back working memory task: Meta-analysis of normative fMRI studies with children, Child Development, 89(6), 2010-2022. ^ Hertzog C, Dixon RA, Hultsch DF, MacDonald SW (December 2003). "Latent change models of adult cognition: are changes in processing speed and working memory associated with changes in episodic memory?". Psychol Aging. 18 (4): 755–69. doi:10.1037/0882-7974.18.4.755. PMID 14692862. ^ a b Park DC, Lautenschlager G, Hedden T, Davidson NS, Smith AD, Smith PK (June 2002). "Models of visuospatial and verbal memory across the adult life span". Psychol Aging. 17 (2): 299–320. doi:10.1037/0882-7974.17.2.299. PMID 12061414. ^ Salthouse, T. A. (1996). "The processing speed theory of adult age differences in cognition". Psychological Review. 103 (3): 403–428. CiteSeerX 10.1.1.464.585. doi:10.1037/0033-295X.103.3.403. PMID 8759042. ^ Mayr, U.; Kliegl, R.; Krampe, R. T. (1996). "Sequential and coordinative processing dynamics in figural transformation across the life span". Cognition. 59 (1): 61–90. doi:10.1016/0010-0277(95)00689-3. PMID 8857471. ^ Hasher, L., & Zacks, R. T. (1988). Working memory, comprehension, and aging: A review and new view. In G. H. Bower (Ed. ), The psychology of learning and motivation, Vol. 22, (pp. 193–225). New York: Academic Press. ^ Hasher, L., Zacks, R. T., & May, C. P. (1999). Inhibitory control, circadian arousal, and age. In D. Gopher & A. Koriat (Eds. ), Attention and Performance (pp. 653–675). Cambridge, MA: MIT Press. ^ West, R. L. (1996). "An application of prefrontal cortex function theory to cognitive aging". Psychological Bulletin. 120 (2): 272–292. doi:10.1037/0033-2909.120.2.272. PMID 8831298. ^ Devlin, H. (8 April 2019). "Scientists reverse memory decline using electrical pulses". The Guardian. ISSN 0261-3077. Retrieved 9 April 2019. ^ Klingberg, T.; Forssberg, H.; Westerberg, H. (September 2002). "Training of working memory in children with ADHD". Journal of Clinical and Experimental Neuropsychology. 24 (6): 781–91. CiteSeerX 10.1.1.326.5165. doi:10.1076/jcen.24.6.781.8395. PMID 12424652. ^ Olesen PJ, Westerberg H, Klingberg T (January 2004). "Increased prefrontal and parietal activity after training of working memory". Nature Neuroscience. 7 (1): 75–9. doi:10.1038/nn1165. PMID 14699419. ^ McNab, F.; Varrone, A.; Farde, L.; et al. (February 2009). "Changes in cortical dopamine D1 receptor binding associated with cognitive training". Science. 323 (5915): 800–2. Bibcode:2009Sci...323..800M. doi:10.1126/science.1166102. PMID 19197069. ^ Jaeggi, S.M. ; Buschkuehl, M.; Jonides, J.; Perrig, W. J. (May 2008). "Improving fluid intelligence with training on working memory". Proceedings of the National Academy of Sciences of the United States of America. 105 (19): 6829–33. Bibcode:2008PNAS..105.6829J. doi:10.1073/pnas.0801268105. PMC 2383929. PMID 18443283. ^ Jaeggi, Susanne M.; Studer-Luethi, Barbara; Buschkuehl, Martin; Su, Yi-Fen; Jonides, John; Perrig, Walter J. (2010). "The relationship between n-back performance and matrix reasoning — implications for training and transfer". Intelligence. 38 (6): 625–635. doi:10.1016/j.intell.2010.09.001. ISSN 0160-2896. ^ Redick, Thomas S.; Shipstead, Zach; Harrison, Tyler L.; Hicks, Kenny L.; Fried, David E.; Hambrick, David Z.; Kane, Michael J.; Engle, Randall W. (2013). "No evidence of intelligence improvement after working memory training: A randomized, placebo-controlled study". Journal of Experimental Psychology: General. 142 (2): 359–379. doi:10.1037/a0029082. ISSN 1939-2222. PMID 22708717. ^ Chooi, Weng-Tink; Thompson, Lee A. (2012). "Working memory training does not improve intelligence in healthy young adults". Intelligence. 40 (6): 531–542. doi:10.1016/j.intell.2012.07.004. ISSN 0160-2896. ^ Au, Jacky; Sheehan, Ellen; Tsai, Nancy; Duncan, Greg J.; Buschkuehl, Martin; Jaeggi, Susanne M. (8 August 2014). "Improving fluid intelligence with training on working memory: a meta-analysis". Psychonomic Bulletin & Review (Submitted manuscript). 22 (2): 366–377. doi:10.3758/s13423-014-0699-x. ISSN 1069-9384. PMID 25102926. ^ Melby-Lervåg, Monica; Redick, Thomas S.; Hulme, Charles (29 July 2016). "Working Memory Training Does Not Improve Performance on Measures of Intelligence or Other Measures of "Far Transfer"". Perspectives on Psychological Science. 11 (4): 512–534. doi:10.1177/1745691616635612. PMC 4968033. PMID 27474138. ^ Jacobsen CF (1938). "Studies of cerebral function in primates". Comparative Psychology Monographs. 13 (3): 1–68. ^ Fuster JM (January 1973). "Unit activity in prefrontal cortex during delayed-response performance: neuronal correlates of transient memory". Journal of Neurophysiology. 36 (1): 61–78. doi:10.1152/jn.1973.36.1.61. PMID 4196203. ^ Ashby FG, Ell SW, Valentin VV, Casale MB (November 2005). "FROST: a distributed neurocomputational model of working memory maintenance". Journal of Cognitive Neuroscience. 17 (11): 1728–43. CiteSeerX 10.1.1.456.7179. doi:10.1162/089892905774589271. PMID 16269109. ^ Goldman-Rakic PS (1995). "Cellular basis of working memory". Neuron. 14 (3): 447–485. doi:10.1016/0896-6273(95)90304-6. PMID 7695894. ^ Rao SG, Williams GV, Goldman-Rakic PS (2000). "Destruction and creation of spatial tuning by disinhibition: GABA(A) blockade of prefrontal cortical neurons engaged by working memory". Journal of Neuroscience. 20 (1): 485–494. doi:10.1523/JNEUROSCI.20-01-00485.2000. PMID 10627624. ^ Arnsten AFT; Paspalas CD; Gamo NJ; Y. Y; Wang M (2010). "Dynamic Network Connectivity: A new form of neuroplasticity". Trends in Cognitive Sciences. 14 (8): 365–375. doi:10.1016/j.tics.2010.05.003. PMC 2914830. PMID 20554470. ^ Robbins TW, Arnsten AF (2009). "The neuropsychopharmacology of fronto-executive function: monoaminergic modulation". Annu Rev Neurosci. 32: 267–287. doi:10.1146/annurev.neuro.051508.135535. PMC 2863127. PMID 19555290. ^ Raffone A, Wolters G (August 2001). "A cortical mechanism for binding in visual working memory". Journal of Cognitive Neuroscience. 13 (6): 766–85. doi:10.1162/08989290152541430. PMID 11564321. ^ O'Reilly, Randall C.; Busby, Richard S.; Soto, Rodolfo (2003). "Three forms of binding and their neural substrates: Alternatives to temporal synchrony". In Cleeremans, Axel (ed.). The unity of consciousness: Binding, integration, and dissociation. Oxford: Oxford University Press. pp. 168–90. ISBN 978-0-19-850857-1. OCLC 50747505. ^ Klimesch, W. (2006). "Binding principles in the theta frequency range". In Zimmer, H. D.; Mecklinger, A.; Lindenberger, U. (eds.). Handbook of binding and memory. Oxford: Oxford University Press. pp. 115–144. ^ Wu X, Chen X, Li Z, Han S, Zhang D (May 2007). "Binding of verbal and spatial information in human working memory involves large-scale neural synchronization at theta frequency". NeuroImage. 35 (4): 1654–62. doi:10.1016/j.neuroimage.2007.02.011. PMID 17379539. ^ Barbey, Aron K.; Koenigs, Michael; Grafman, Jordan (2013). "Dorsolateral prefrontal contributions to human working memory". Cortex. 49 (5): 1195–1205. doi:10.1016/j.cortex.2012.05.022. PMC 3495093. PMID 22789779. ^ Owen, A. M. (July 1997). "The functional organization of working memory processes within human lateral frontal cortex: the contribution of functional neuroimaging". The European Journal of Neuroscience. 9 (7): 1329–39. doi:10.1111/j.1460-9568.1997.tb01487.x. PMID 9240390. ^ Smith EE, Jonides J (March 1999). "Storage and executive processes in the frontal lobes". Science. 283 (5408): 1657–61. CiteSeerX 10.1.1.207.8961. doi:10.1126/science.283.5408.1657. PMID 10073923. ^ Smith, E. E.; Jonides, J.; Marshuetz, C.; Koeppe, R. A. (February 1998). "Components of verbal working memory: evidence from neuroimaging". Proceedings of the National Academy of Sciences of the United States of America. 95 (3): 876–82. Bibcode:1998PNAS...95..876S. doi:10.1073/pnas.95.3.876. PMC 33811. PMID 9448254. ^ Honey, G. D.; Fu, C. H.; Kim, J.; et al. (October 2002). "Effects of verbal working memory load on corticocortical connectivity modeled by path analysis of functional magnetic resonance imaging data". NeuroImage. 17 (2): 573–82. doi:10.1016/S1053-8119(02)91193-6. PMID 12377135. ^ Mottaghy, F. M. (April 2006). "Interfering with working memory in humans". Neuroscience. 139 (1): 85–90. doi:10.1016/j.neuroscience.2005.05.037. PMID 16337091. ^ Curtis, C. E.; D'Esposito, M. (September 2003). "Persistent activity in the prefrontal cortex during working memory". Trends in Cognitive Sciences. 7 (9): 415–423. CiteSeerX 10.1.1.319.8928. doi:10.1016/S1364-6613(03)00197-9. PMID 12963473. ^ Postle BR (April 2006). "Working memory as an emergent property of the mind and brain". Neuroscience. 139 (1): 23–38. doi:10.1016/j.neuroscience.2005.06.005. PMC 1428794. PMID 16324795. ^ Collette, F.; Hogge, M.; Salmon, E.; Van der Linden, M. (April 2006). "Exploration of the neural substrates of executive functioning by functional neuroimaging". Neuroscience. 139 (1): 209–21. doi:10.1016/j.neuroscience.2005.05.035. hdl:2268/5937. PMID 16324796. ^ Wager, Tor D.; Smith, Edward E. (1 December 2003). "Neuroimaging studies of working memory: a meta-analysis". Cognitive, Affective & Behavioral Neuroscience. 3 (4): 255–274. doi:10.3758/cabn.3.4.255. ISSN 1530-7026. PMID 15040547. ^ a b Bledowski, C.; Rahm, B.; Rowe, J. B. (October 2009). "What 'works' in working memory? Separate systems for selection and updating of critical information". The Journal of Neuroscience. 29 (43): 13735–41. doi:10.1523/JNEUROSCI.2547-09.2009. PMC 2785708. PMID 19864586. ^ Coltheart, M. (April 2006). "What has functional neuroimaging told us about the mind (so far)?". Cortex. 42 (3): 323–31. doi:10.1016/S0010-9452(08)70358-7. PMID 16771037. ^ Kondo, H.; Osaka, N.; Osaka, M. (October 2004). "Cooperation of the anterior cingulate cortex and dorsolateral prefrontal cortex for attention shifting". NeuroImage. 23 (2): 670–9. doi:10.1016/j.neuroimage.2004.06.014. PMID 15488417. ^ Osaka N, Osaka M, Kondo H, Morishita M, Fukuyama H, Shibasaki H (February 2004). "The neural basis of executive function in working memory: an fMRI study based on individual differences". NeuroImage. 21 (2): 623–31. doi:10.1016/j.neuroimage.2003.09.069. PMID 14980565. ^ Arnsten, A. F. (June 1998). "The biology of being frazzled". Science. 280 (5370): 1711–2. doi:10.1126/science.280.5370.1711. PMID 9660710. ^ Arnsten, AF (June 2009). "Stress signalling pathways that impair prefrontal cortex structure and function". Nature Reviews Neuroscience. 10 (6): 410–22. doi:10.1038/nrn2648. PMC 2907136. PMID 19455173. ^ Radley, J. J.; Rocher, A. B.; Miller, M.; Janssen, W. G.; Liston, C.; Hof, P. R.; McEwen, B. S.; Morrison, J. H. (March 2006). "Repeated stress induces dendritic spine loss in the rat medial prefrontal cortex". Cereb Cortex. 16 (3): 313–20. doi:10.1093/cercor/bhi104. PMID 15901656. ^ Hains, A. B.; Vu, M. A.; Maciejewski, P. K.; van Dyck, C. H.; Gottron, M.; Arnsten, A. F. (October 2009). "Inhibition of protein kinase C signaling protects prefrontal cortex dendritic spines and cognition from the effects of chronic stress". Proceedings of the National Academy of Sciences. 106 (42): 17957–62. Bibcode:2009PNAS..10617957H. doi:10.1073/pnas.0908563106. PMC 2742406. PMID 19805148. ^ Qin S, Hermans EJ, van Marle HJ, Luo J, Fernández G (July 2009). "Acute psychological stress reduces working memory-related activity in the dorsolateral prefrontal cortex". Biological Psychiatry. 66 (1): 25–32. doi:10.1016/j.biopsych.2009.03.006. PMID 19403118. ^ Liston C, McEwen BS, Casey BJ (January 2009). "Psychosocial stress reversibly disrupts prefrontal processing and attentional control". Proceedings of the National Academy of Sciences. 106 (3): 912–7. Bibcode:2009PNAS..106..912L. doi:10.1073/pnas.0807041106. PMC 2621252. PMID 19139412. ^ Revlin, Russell (2007). Human Cognition : Theory and Practice (International ed.). New York, NY: Worth Pub. p. 147. ISBN 978-0-7167-5667-5. ^ van Holst RJ, Schilt T (March 2011). "Drug-related decrease in neuropsychological functions of abstinent drug users". Curr Drug Abuse Rev. 4 (1): 42–56. doi:10.2174/1874473711104010042. PMID 21466500. ^ Jacobus J.; Tapert S. F. (2013). "Neurotoxic Effects of Alcohol in Adolescence". Annual Review of Clinical Psychology. 9 (1): 703–721. doi:10.1146/annurev-clinpsy-050212-185610. PMC 3873326. PMID 23245341. ^ Weiland BJ, Nigg JT, Welsh RC, Yau WY, Zubieta JK, et al. (2012). "Resiliency in adolescents at high risk for substance abuse: flexible adaptation via subthalamic nucleus and linkage to drinking and drug use in early adulthood". Alcohol. Clin. Exp. Res. 36 (8): 1355–64. doi:10.1111/j.1530-0277.2012.01741.x. PMC 3412943. PMID 22587751. ^ Tapert SF, Brown GG, Kindermann SS, Cheung EH, Frank LR, Brown SA (2001). "fMRI measurement of brain dysfunction in alcohol-dependent young women". Alcohol. Clin. Exp. Res. 25 (2): 236–45. doi:10.1111/j.1530-0277.2001.tb02204.x. PMID 11236838. ^ Ferrett HL, Carey PD, Thomas KG, Tapert SF, Fein G (2010). "Neuropsychological performance of South African treatment-naive adolescents with alcohol dependence". Drug Alcohol Depend. 110 (1–2): 8–14. doi:10.1016/j.drugalcdep.2010.01.019. PMC 4456395. PMID 20227839. ^ Crego A, Holguin SR, Parada M, Mota N, Corral M, Cadaveira F (2009). "Binge drinking affects attentional and visual working memory processing in young university students". Alcohol. Clin. Exp. Res. 33 (11): 1870–79. doi:10.1111/j.1530-0277.2009.01025.x. hdl:10347/16832. PMID 19673739. ^ Greenstein JE, Kassel JD, Wardle MC, Veilleux JC, Evatt DP, Heinz AJ, Yates MC (2010). "The separate and combined effects of nicotine and alcohol on working memory capacity in nonabstinent smokers". Experimental and Clinical Psychopharmacology. 18 (2): 120–128. doi:10.1037/a0018782. PMID 20384423. ^ Squeglia LM, Schweinsburg AD, Pulido C, Tapert SF (2011). "Adolescent binge drinking linked to abnormal spatial working memory brain activation: Differential gender effects". Alcoholism: Clinical and Experimental Research. 35 (10): 1831–1841. doi:10.1111/j.1530-0277.2011.01527.x. PMC 3183294. PMID 21762178. ^ Boissoneault J, Sklar A, Prather R, Nixon SJ (2014). "Acute effects of moderate alcohol on psychomotor, set shifting, and working memory function in older and younger social drinkers". Journal of Studies on Alcohol and Drugs. 75 (5): 870–879. doi:10.15288/jsad.2014.75.870. PMC 4161706. PMID 25208205. ^ a b Engelhardt, Laura E.; Mann, Frank D.; Briley, Daniel A.; Church, Jessica A.; Harden, K. Paige; Tucker-Drob, Elliot M. (2016). "Strong genetic overlap between executive functions and intelligence". Journal of Experimental Psychology: General. 145 (9): 1141–1159. doi:10.1037/xge0000195. PMC 5001920. PMID 27359131. ^ a b Ando, Juko; Ono, Yutaka; Wright, Margaret J. (2001). "Genetic Structure of Spatial and Verbal Working Memory". Behavior Genetics. 31 (6): 615–624. doi:10.1023/A:1013353613591. ISSN 0001-8244. ^ Blokland, Gabriëlla A. M.; McMahon, Katie L.; Thompson, Paul M.; Martin, Nicholas G.; de Zubicaray, Greig I.; Wright, Margaret J. (27 July 2011). "Heritability of Working Memory Brain Activation". Journal of Neuroscience. 31 (30): 10882–10890. doi:10.1523/jneurosci.5334-10.2011. PMC 3163233. PMID 21795540. ^ Bates, Timothy (2011). "Genetic Variance in a Component of the Language Acquisition Device: ROBO1 Polymorphisms Associated with Phonological Buffer Deficits". Behavior Genetics. 41 (1): 50–7. doi:10.1007/s10519-010-9402-9. PMID 20949370. Retrieved 1 September 2016 – via PsycINFO. ^ Daneman, Meredyth; Carpenter, Patricia A. (1 August 1980). "Individual differences in working memory and reading". Journal of Verbal Learning and Verbal Behavior. 19 (4): 450–466. doi:10.1016/S0022-5371(80)90312-6. ^ Daneman, Meredyth; Merikle, Philip M. (1996). "Working memory and language comprehension: A meta-analysis". Psychonomic Bulletin & Review. 3 (4): 422–433. doi:10.3758/BF03214546. ISSN 1069-9384. PMID 24213976. ^ Swanson, H. Lee; Beebe-Frankenberger, Margaret (2004). "The Relationship Between Working Memory and Mathematical Problem Solving in Children at Risk and Not at Risk for Serious Math Difficulties". Journal of Educational Psychology. 96 (3): 471–491. doi:10.1037/0022-0663.96.3.471. ^ Alloway TP, Alloway RG (2010). "Investigating the predictive roles of working memory and IQ in academic attainment" (PDF). Journal of Experimental Child Psychology. 106 (1): 20–9. doi:10.1016/j.jecp.2009.11.003. PMID 20018296. ^ Alloway TP, Gathercole SE, Kirkwood H, Elliott J (2009). "The cognitive and behavioral characteristics of children with low working memory". Child Development. 80 (2): 606–21. doi:10.1111/j.1467-8624.2009.01282.x. hdl:1893/978. PMID 19467014. ^ Gathercole, Susan E.; Pickering, Susan J. (1 June 2000). "Working memory deficits in children with low achievements in the national curriculum at 7 years of age". British Journal of Educational Psychology. 70 (2): 177–194. doi:10.1348/000709900158047. ISSN 2044-8279. PMID 10900777. ^ Alloway, Tracy Packiam (2009). "Working Memory, but Not IQ, Predicts Subsequent Learning in Children with Learning Difficulties". European Journal of Psychological Assessment. 25 (2): 92–8. doi:10.1027/1015-5759.25.2.92. hdl:1893/1005. ^ Pickering, Susan J. (2006). Tracy Packiam Alloway; Susan E Gathercole (eds.). Working memory in dyslexia. Working memory and neurodevelopmental disorders. New York, NY: Psychology Press. ISBN 978-1-84169-560-0. OCLC 63692704. ^ Wagner, Richard K.; Muse, Andrea (2006). Tracy Packiam Alloway; Susan E Gathercole (eds.). Short-term memory deficits in developmental dyslexia. Working memory and neurodevelopmental disorders. New York, NY: Psychology Press. ISBN 978-1-84169-560-0. OCLC 63692704. ^ Roodenrys, Steve (2006). Tracy Packiam Alloway; Susan E Gathercole (eds.). Working memory function in attention deficit hyperactivity disorder. orking memory and neurodevelopmental disorders. New York, NY: Psychology Press. ISBN 978-1-84169-560-0. OCLC 63692704. ^ Alloway, Tracy Packiam (2006). Tracy Packiam Alloway; Susan E Gathercole (eds.). Working memory skills in children with developmental coordination disorder. orking memory and neurodevelopmental disorders. New York, NY: Psychology Press. ISBN 978-1-84169-560-0. OCLC 63692704. ^ Zanto, T. P.; Gazzaley, A. (March 2009). "Neural suppression of irrelevant information underlies optimal working memory performance". The Journal of Neuroscience. 29 (10): 3059–66. doi:10.1523/JNEUROSCI.4621-08.2009. PMC 2704557. PMID 19279242. ^ Berry, A. S.; Zanto, T. P.; Rutman, A. M.; Clapp, W. C.; Gazzaley, A. (2009). "Practice-related improvement in working memory is modulated by changes in processing external interference". Journal of Neurophysiology. 102 (3): 1779–89. doi:10.1152/jn.00179.2009. PMC 2746773. PMID 19587320. ^ a b Fukuda K, Vogel EK (July 2009). "Human variation in overriding attentional capture". The Journal of Neuroscience. 29 (27): 8726–33. doi:10.1523/JNEUROSCI.2145-09.2009. PMID 19587279. ^ Desimone R, Duncan J (1995). "Neural mechanisms of selective visual attention". Annual Review of Neuroscience. 18: 193–222. doi:10.1146/annurev.ne.18.030195.001205. PMID 7605061. ^ Yantis S, Jonides J (February 1990). "Abrupt visual onsets and selective attention: voluntary versus automatic allocation". Journal of Experimental Psychology. Human Perception and Performance. 16 (1): 121–34. CiteSeerX 10.1.1.211.5016. doi:10.1037/0096-1523.16.1.121. PMID 2137514. ^ Mall, Jonathan T.; Morey, Candice C.; Wolff, Michael J.; Lehnert, Franziska (9 January 2014). "Visual selective attention is equally functional for individuals with low and high working memory capacity: Evidence from accuracy and eye movements" (PDF). Attention, Perception, & Psychophysics. 76 (7): 1998–2014. doi:10.3758/s13414-013-0610-2. ISSN 1943-3921. PMID 24402698. ^ a b Willcutt EG, Doyle AE, Nigg JT, Faraone SV, Pennington BF (June 2005). "Validity of the executive function theory of attention-deficit/hyperactivity disorder: a meta-analytic review". Biol. Psychiatry. 57 (11): 1336–46. doi:10.1016/j.biopsych.2005.02.006. PMID 15950006. ^ Clark L, Blackwell AD, Aron AR, et al. (June 2007). "Association between response inhibition and working memory in adult ADHD: a link to right frontal cortex pathology?". Biol. Psychiatry. 61 (12): 1395–401. doi:10.1016/j.biopsych.2006.07.020. PMID 17046725. ^ Roodenrys, Steven; Koloski, Natasha; Grainger, Jessica (2001). "Working memory function in attention deficit hyperactivity disordered and reading disabled children". British Journal of Developmental Psychology. 19 (3): 325–337. doi:10.1348/026151001166128. ISSN 0261-510X. ^ Lee, Eun-Young (5 August 2010). "Visual working memory deficits in patients with Parkinson's disease are due to both reduced storage capacity and impaired ability to filter out irrelevant information". Brain. 133 (9): 2677–2689. doi:10.1093/brain/awq197. PMC 2929336. PMID 20688815. ^ Tiaotiao, Liu (December 2014). "Functional connectivity in a rat model of Alzheimer's disease during a working memory task". Current Alzheimer Research. 11 (10): 981–991. doi:10.2174/1567205011666141107125912. PMID 25387338. ^ Poudel, Govinda R. (January 2015). "Functional changes during working memory in Huntington's disease: 30-month longitudinal data from the IMAGE-HD study". Brain Structure and Function. 220 (1): 501–512. doi:10.1007/s00429-013-0670-z. PMID 24240602. Peter Doolittle: How your "working memory" makes sense of the world, TED Talk, published November 22, 2013.